These days when it seems like everyone has a smart phone, it seems appropriate to check in on the Gluten Free “App” scene. To be honest, there’s not much of a scene yet. A few results show up when searching for apps, though the majority seem to be a website in app form, which is not worth purchasing, in my opinion. Is that Gluten Free? is one of the few that I’ve purchased and tried. Available for iPhone and iPad, this $7.99 app has a plethora of ingredient, product and brand listings, color-coded for navigation. If you’re in the grocery aisle and come across an ingredient listing you’re unsure about, this app will most likely have an answer. Nicely, the info is available even if you don’t have a cell signal. The fact that the info is often verified and updated means you’ll be set when companies finally start coming around to the gluten-free product world. 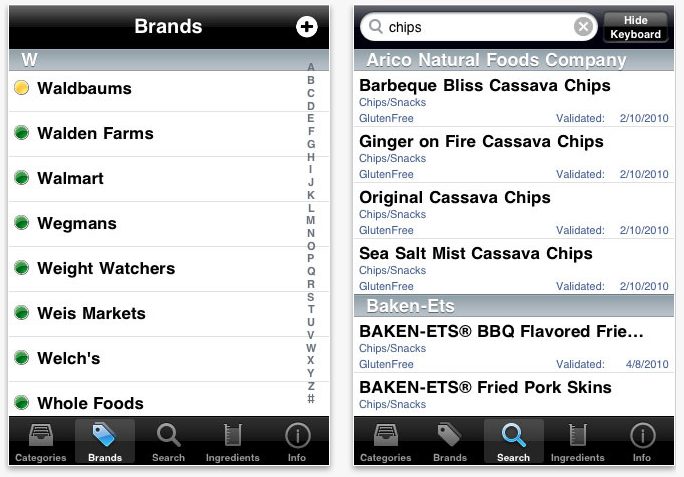 When browsing by brand, the app integrates the companies’ dietary statements as well as the ability to rate the product, and take notes. The drawbacks for the app is the lack of graphical integration. I’m a visual thinker, and I’d like to see logos and photos of the products, as well as listings. The app is also lacking a barcode scanner, an existing technology that would certainly make this tool worth it’s relatively high cost. When free apps regularly amaze and delight, I expect a whole lot when paying $8. Indeed, I’d say in summation, this app is decent but not amazing. For half the price, it would feel like a good buy. At the moment, it’s a bit overpriced and under-featured. Final note: To all the brilliant programmers out there, get to work, there’s money to be made in the gluten-free app world! This entry was posted in Baking, Beer, Beverages, Cooking, Culture, Health, Reviews, Website and tagged app, Apps, gluten free apps, ingredient listings, ipad gluten free, iphone gluten free, Is That Gluten Free? 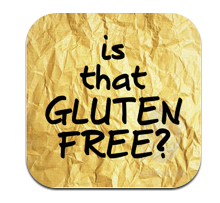 Is That Gluten Free App, technology on April 12, 2011 by glutenfreepdx.